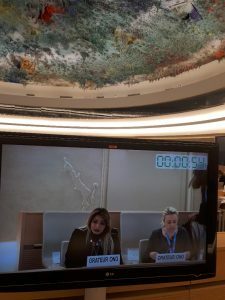 Bitter Winter discussed the disappointing, but not unexpected, report released on March 15 by the troika consisting of Saudi Arabia, Kenya, and Hungary about human rights in China for the Universal Periodic Review. The importance of the report should, on the other hand, not be exaggerated. International media understand that the report is politically negotiated, and that, for reasons we explained, the three countries of the troika could not be expected to deliver a truly balanced document. What was more important was the discussion at the United Nations connected with China’s Universal Periodic Review, which lasted for several months and allowed dozens of countries and NGOs to file documents and call the international attention on the horrific situation of human rights in China. The general discussion of November 7, 2018 attracted much more media attention than the report, thanks also to the public demonstration organized outside of the Palais des Nations in Geneva by several victims of Chinese persecution, including Uyghur Muslims, Tibetan Buddhists, and members of The Church of Almighty God. The report will probably be used by the CCP for domestic consumption, but the journey leading to it offered a unique opportunity for its victims to be heard. There was, however, an opportunity for comments to the report on March 15. China Deputy Foreign Minister Le Yucheng delivered more CCP propaganda, claiming the “transformation through education” camps are in reality “campuses, not camps” and that “he had recently visited some Uighur centers in Xinjiang — and played ping pong and ate halal food there.” Bitter Winter is indeed informed that such fancy places exist – they are false camps, “Potemkin villages” where foreign visitors and reporters are taken. At any rate, Le said that the camps will be closed in the future. Only, he forgot to say when. Norway deserves praise for standing up and calling the Chinese answer to criticism on camps in Xinjiang inadequate and disappointing. Several NGOs also criticized China in the Geneva discussion. Of particular interest was the intervention of Christine Mirre, of the ECOSOC-accredited French NGO CAP-LC (her speech is on the official Web site of the United Nations, starting from minute 1:21:08, but we also offer it as a video).